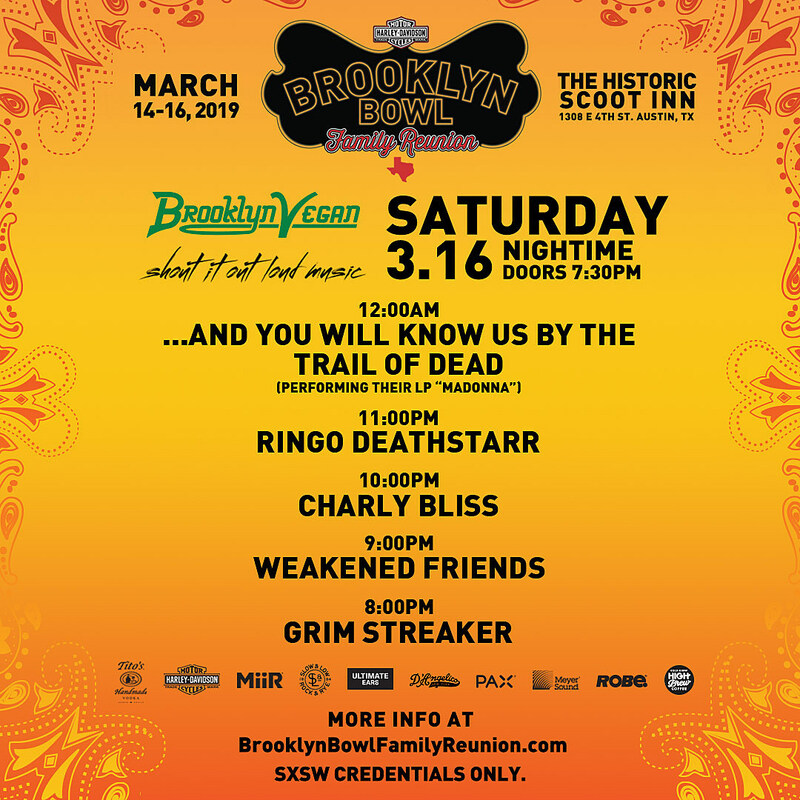 After our day parties at Mohawk wrapped up, we hosted the BrooklynVegan/Shout It Loud Out Loud Music SXSW showcase at Brooklyn Bowl Family Reunion, presented by Harley Davidson, at Scoot Inn on Saturday (3/16). The headliners were Austin locals …And You Will Know Us by the Trail of Dead, who performed their 1999 album Madonna in full for its 20th anniversary and then encored with “Will You Smile Again?” off 2005’s Worlds Apart. Before Trail of Dead, Brooklyn’s Grim Streaker opened the night with a set of their ’70s/’80s-style punk that had singer Amelia Bushell owning the stage and going nuts the whole time (including during a faithful cover of Devo’s “Gut Feeling”). Up next were Portland, Maine’s Don Giovanni-signed Weakened Friends, who seemed thrilled to be playing, shouted out their hometown several times (they half-jokingly said something like “we’re a band you’ve never heard of from a place you’ve never heard of”), and who had an on-stage chemistry and energy that was even better than their records. If it’s true that they’re a band you’ve never heard of, but you like crunchy Weezer-y power pop, it’s worth checking them out (J Mascis – who appears on their 2018 album Common Blah — would probably agree). Next up were Charly Bliss, who mixed songs from their acclaimed 2017 debut Guppy with songs from their upcoming sophomore album Young Enough (due 5/10 via Barsuk), and sounded tight the whole time. They had some electronics on stage for the newer songs, but Eva Hendricks introduced one newer song by saying “this one’s for all the people who think there won’t be any guitars on our new record,” and proceeded to play a driving rocker that would’ve fit well on their debut. Then Ringo Deathstarr took over with their wall-of-sound shoegaze, that added a layer of atmosphere to the night and got the crowd prepped for the intensity of Trail of Dead. Pictures of all five bands are in the gallery above. Trail of Dead, Weakened Friends, and Grim Streaker’s sets streamed live and you can watch archived videos of their sets below.